Saturday, May 30th, will mark an important day in the history of South Carolina’s fire service. On this day in 1905, a group of visionaries came together to organize and frame the foundation of this Association. 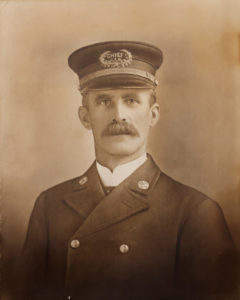 Then Charleston’s Assistant Chief Louis Behrens called a meeting of his closest allies and fire service leaders for the purpose of organizing a State Firemen’s Association. The meeting took place at the headquarters of the Columbia Fire Department with Fire Chief W. J. May hosting the occasion. Also present were C. S. Cromer (No. 1 Hose Wagon of Columbia), J. A. MJullikin (No. 3 Hose Wagon of Columbia), W. C. Dowie (No. 1 Truck Co. of Columbia) and T. C. Zoble (Chemical Engine of Columbia). Serving as an advisor to the group was Captain James D. McNeill of the Fayetteville, N.C.,Fire Department who was invited to provide input to the meeting because of his experiences as President of the North Carolina State Firemen’s Association. Chief Behrens was unanimously elected to serve as President; M. Greenewald as 1st VP; F. G. Austin as 2nd VP; R. S. Hood as Secretary; O. S. Dibble as Treasurer; and J. A. Mullikin as Statistician. It is interesting to note that Chief Behrens served as President until 1932 (27 years) until his death during Fire Prevention Week of that year. The first annual conference of the newly formed State Firemen’s Association was held in Columbia during fair week in October of 1905. Chief Behrens personally wrote letters of invitation to the chiefs of all known organized fire departments in the State to come together to hear committee reports and to discuss a proposed bill to be introduced in the General Assembly that would create a fund for firemen to be derived from a 1 % tax on fire insurance premiums (our current 1% Fund). Of course, no meeting of the Firemen’s Association would be complete without the colorful competitions that provided bragging rights to the winners of the fastest hose lays, ladder raises, and most decorated steam engines and horse-drawn hose wagons. Interestingly, some 250 firemen in the State initially joined the Association as members. Twenty-one years later (1926) our membership had grown to over 2,500 members. Annual meetings were held in different cities over the State and brought firefighters together to showcase the latest in fire apparatus and equipment, to conduct training on the most current firefighting technologies, to effect Association business, and to provide opportunities to network with the brightest and best fire service leaders in the State. 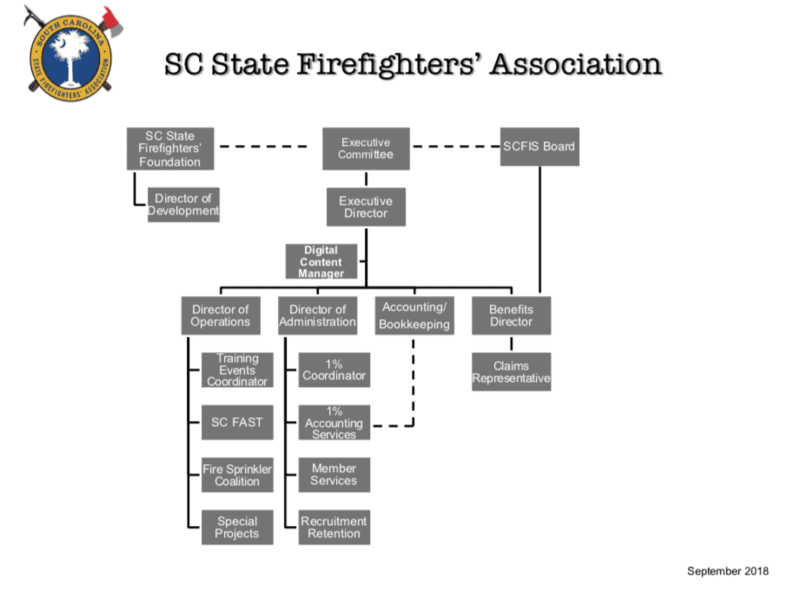 In the years since that historical meeting in Columbia, the South Carolina State Firefighters’ Association has grown to a membership of over 17,500 members. To celebrate our 110th Year Anniversary, President Will Vaigneur and in-coming President Tommy Norris, have commissioned a history booth (#1961) at our annual conference next month. The booth will feature some fascinating and educational exhibits that chronicle our Association’s history and development. Many of the exhibits have never been seen before by our membership; some dating back from before the Civil War. Many departments are contributing to this exhibit, and we invite you to come by the booth to travel back in time to the days of magnificence; of steam engines, leather buckets, silver trophies, and photographs which capture the beginnings of this great Association.